Here we are at the second appointment on 2008 weddings I forgot to tell you about before but that I really want to write on. This wedding, as the previous one took place last September too. As floral designer, September for me is one of the most busy month of the year and last one was even busier! September 2009 will be more or less the same. For this reason I always recommend to my couples booking their dates with large advance, especially if they are thinking about a date between June and September. You could not find availability, some dates are booked at least a year in advance! Sabrina and Mauro wedding took place on 21 September the first day of Autumn. 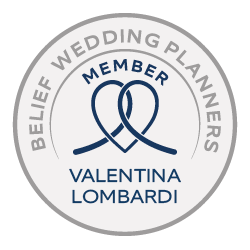 For the first time we are talking about an Italian couple, coming from Milan that chose Stresa for their big day! 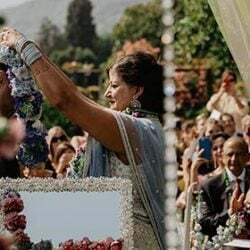 One of the reasons because I love talking about this wedding was the excellent choice of bridegroom to concentrate all the events in Stresa with just little transfers. You could take a look at the wonderful PHOTO GALLERY realized by Alessandro Balossi from Omegna. 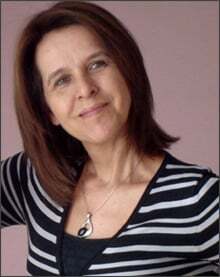 I also suggest reading the interesting article The photographer of smiling brides that tells perfectly his charming style. 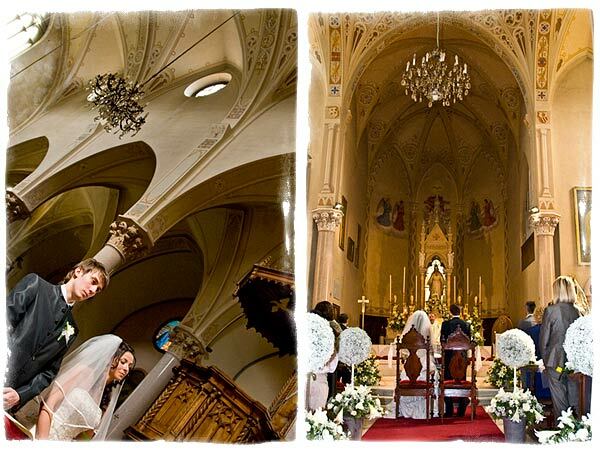 For their religious ceremony Sabrina and Mauro chose the lovely gothic church of San Carciano just on a hill in the Northen part of Stresa close to the beach. San Carciano’s parish priest is a lovely person and he proudly and pleasantly welcomes brides and grooms coming from other cities or countries. A lot of people coming from abroad – Great Britain especially – choose this church for their catholic ceremony. San Carciano church has a beautiful stone entrance embellished with ball buxus trees. From its hill the view on Lake Maggiore is stunning! I love working inside this wonderful church because of wide spaces, around the altar, and the amazing brightness of the room that en-light every flower decoration. Color scheme Sabrina and Mauro choose was yellow and white. 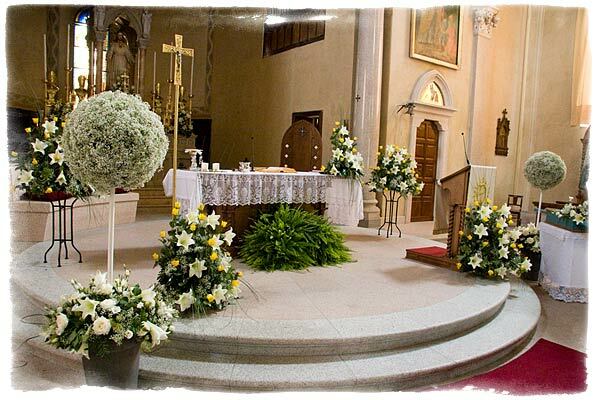 In the church white was represented by Lilium Longiflorum and a great utilization of baby’s breath and greenery. 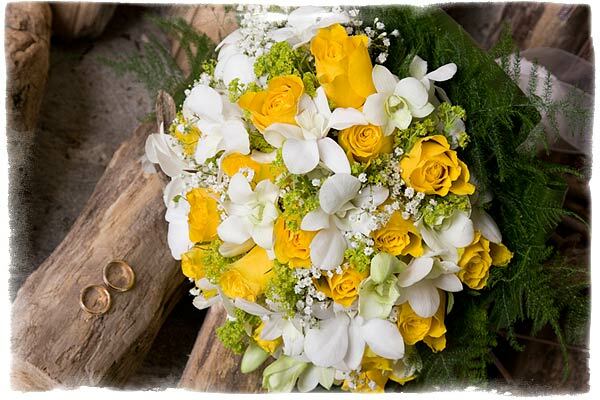 Yellow was represented by wonderful Golden Times roses that matched the bridal bouquet together with Dendrobium Orchids and a touch of green Alchemilla. One of the advantages of getting married in San Carciano church is being out of the traffic of Stresa center which is usually very touristy. 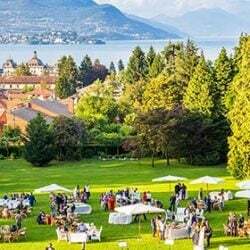 Moreover we are very close to Villa Muggia, one of the best venues on Lake Maggiore where Mauro and Sabrina decided to celebrate their wedding reception. As far as the floral decorations to Villa Muggia are concerned I kept on following the color scheme bridegroom chose just changing type of flowers. This time I opted for white Anthuriums with long willows of white grapes around a candle together with romantic ivy. Just to remind us the first day of Autumn. 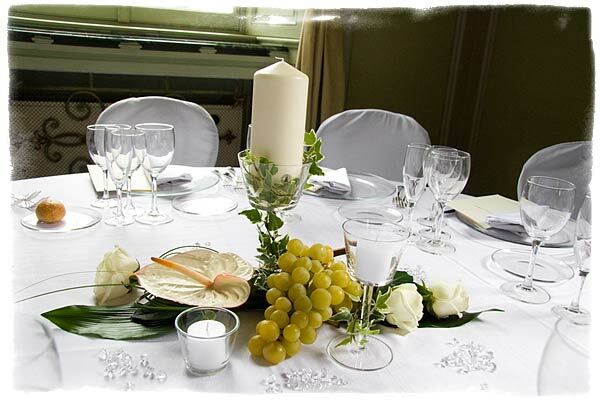 A very stylized centerpiece but very elegant the fitted perfectly in wonderful rooms of Villa Muggia. For their wedding photographs bride and groom choose beautiful scenery of Isola Bella, They reached it by boat in just few minutes leaving from Stresa pier. Sabrina and Mauro’s wedding was to me a perfect example of how to organize a wedding with few transfers from ceremony to photographs setting and then finally reception venue. They achieved a perfect final result, thanks also to magic beauty of those places….we are in Stresa the real pearl of Lake Maggiore! 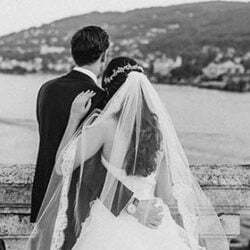 For any information about wedding in Stresa please contact us.